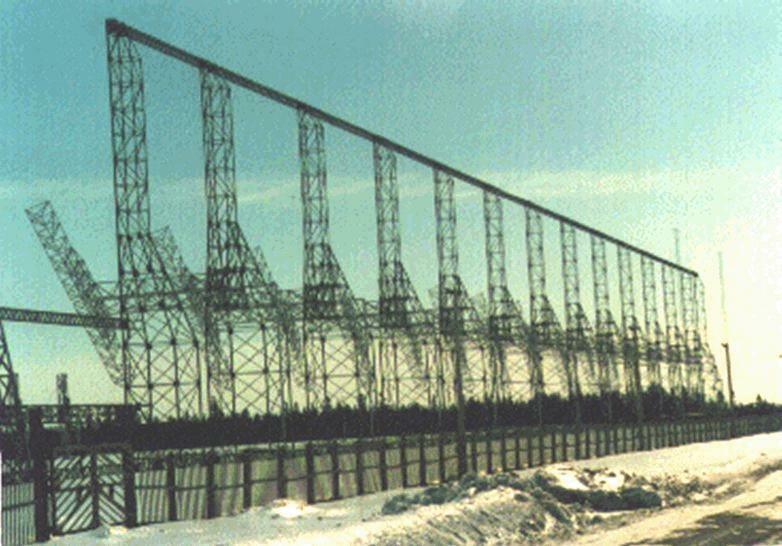 The U.S. Air Force's over-the-horizon-backscatter (OTH-B) air defense radar system is by several criteria the largest radar system in the world. 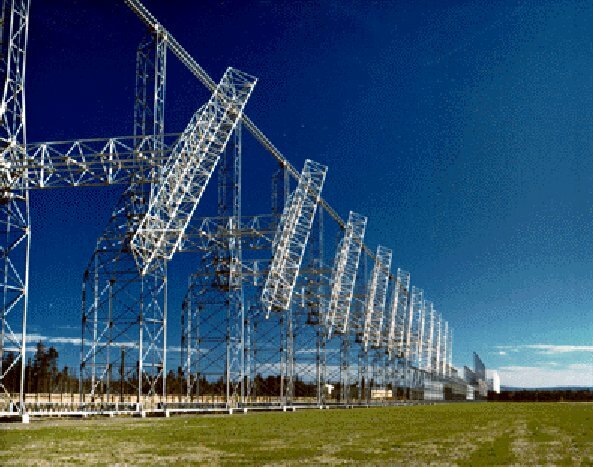 Six one-million-watt OTH radars see far beyond the range of conventional microwave radars by bouncing their 5-28-MHz waves off the ionosphere, an ionized layer about 200 km above the earth. It was developed over 25 years at a cost of $1.5 billion to warn against Soviet bomber attacks when the planes were still thousands of miles from US air space. The prototype was built in Maine, with the transmitter at Moscow Air Force Station [45°08'14"N 69°48'07W] and the receiver at Columbia Air Force Station [44°47'42"N 67°48'41"W]. 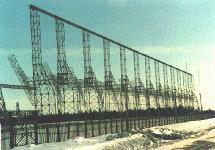 Experimental transmissions from the Maine site covered an arc from 16.5° to 76.5° and from 900 to 3,300 km in range. Initial testing was conducted from June 1980 to June 1981. GE Aerospace (now Lockheed Martin Ocean, Radar and Sensor Systems) in received a contract in mid-1982 for full-scale development of the program. The West Coast Sector included an operations center at Mountain Home Air Force Base, Idaho, the transmitter at Christmas Valley, Oregon [43°16'00"N 120°21'40"W], and the receiver at Tule Lake, near Alturas, California. GE Aerospace was initially awarded a contract valued at $145 million for the first two sectors of the West Coast system, with an additional contract for the third sector for $56 million awarded in November 1987. The total value of the West Coast system contract was expected to be approximately $313 million. 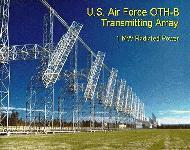 The system was turned over to the USAF at the end of 1990 for operational tests and evaluation. The Air Force maintains the six East Coast and West Coast OTH-B radars in a state called "warm storage," which preserves the physical and electrical integrity of the system and permits recall, should a need arise. It would require at least 24 months to bring these first generation OTH-B radars out of caretaker status and into an operational status-if such a decision to do so were made. Major upgrades costing millions of dollars would be necessary to bring the outdated technologies up to modern standards. The incremental cost of operating the East Coast OTH-B system for environmental research and services is about $1.0M to $1.5M per year. The environmental monitoring aspects of the system are unclassified. Similar coverage in the eastern Pacific could be obtained at about the same cost. In 1991, NOAA recognized the potential of these military relics of the cold war for environmental monitoring and asked the Air Force's permission to look at the part of the radar echo that the Air Force throws away -- the ocean clutter. NOAA's tests showed that this clutter can be processed to extract ocean surface wind direction over huge, data-sparse ocean areas -- vital information that affects climate and the ocean's circulation. Tropical storms and hurricanes were tracked, and a system for delivering radar-derived winds to the National Hurricane Center was developed. The combined coverage of the six OTH-B radars is about 90 million square kilometers of open ocean where few weather instruments exist. Recent tests have also demonstrated OTH radars ability to map ocean currents. Operator U.S. Air Force, Air Combat Command, Newport News, VA / Lockheed Martin Co.